In 1818 Hampstead, the fashionable Fanny Brawne (Abbie Cornish) is introduced to poet John Keats (Ben Whishaw) through the Dilke family. The Dilkes occupy one half of a double house, with Charles Brown (Paul Schneider) occupying the other half. Brown is Keats' friend, roommate, and associate in writing. Fanny's flirtatious personality contrasts with Keats' notably more aloof nature. She begins to pursue him after her siblings Samuel and Toots obtain his book of poetry "Endymion". Her efforts to interact with the poet are fruitless until he witnesses her grief for the loss of his brother Tom. Keats begins to open up to her advances while spending Christmas with the Brawne family. He begins giving her poetry lessons, and it becomes apparent that their attraction is mutual. Fanny is nevertheless troubled by his reluctance to pursue her, for which her mother (Kerry Fox) surmises, "Mr. Keats knows he cannot like you, he has no living and no income." It is only after Fanny receives a valentine from Brown that Keats passionately confronts them and asks if they are lovers. Brown sent the valentine in jest, but he warns Keats that Fanny is a mere flirt playing a game. Fanny is hurt by Brown's accusations and by Keats' lack of faith in her; she ends their lessons and leaves. The Dilkes move to Westminster in the spring, leaving the Brawne family their half of the house and six months rent. Fanny and Keats then resume their interaction and fall deeply in love. The relationship comes to an abrupt end when Brown departs with Keats for his summer rental, where Keats may earn some money. Fanny is heartbroken, though she is comforted by Keats' love letters. When the men return in the autumn, Fanny's mother voices her concern that Fanny's attachment to the poet will hinder her from being courted. Fanny and Keats secretly become engaged. Keats contracts tuberculosis the following winter. He spends several weeks recovering until spring. His friends collect funds so that he may spend the next winter in Italy, where the climate is warmer. After Brown impregnates a maid and is unable to accompany him, Keats manages to find residence in London for the summer, and is later taken in by the Brawne family following an attack of his illness. When his book sells with moderate success, Fanny's mother gives him her blessing to marry Fanny once he returns from Italy. The night before he leaves, he and Fanny say their tearful goodbyes in privacy. Keats dies in Italy the following February of complications from his illness, just as his brother Tom did earlier in the film. In the last moments of the film, Fanny cuts her hair in an act of mourning, dons black attire, and walks the snowy paths that Keats had walked many times. It is there that she recites the love sonnet that he had written for her called "Bright Star" as she grieves the death of her lover. Like the real life Fanny Brawne, Fanny in the film is a fiery and fashionable eighteen-year-old who spends her time creating dresses, hats, and various other garments. She is also something of a flirt and enjoys attending balls, inciting Keats' jealousy. Though the real life Fanny Brawne went on to marry and have children, she never sold Keats' love letters.They were sold after her death by her children. The film garnered positive reviews from critics. Review aggregator Rotten Tomatoes reports that 83% out of 166 critics gave the film a positive review, with an average score of 7.3/10. The website's critical consensus states, "Jane Campion's direction is as refined as her screenplay, and she gets the most out of her cast – especially Abbie Cornish – in this understated period drama." On Metacritic, the film has a weighted average score of 81 out of 100, based on 34 critics, indicating "universal acclaim". Poet and scholar Stanley Plumly, the author of Posthumous Keats: A Personal Biography, wrote of the film's writing and direction: "Jane Campion has understood the richly figurative in Keats’ life without sacrificing the literal wealth of its texture. She has evoked the mystery of his genius without giving up the reality of its dailiness." A collection of Keats's love letters and selected poems was published in 2009 as a companion to the motion picture, entitled Bright Star: Love Letters and Poems of John Keats to Fanny Brawne. The 144-page book was published by Penguin and includes an introduction written by Campion. ^ movies.yahoo.com Archived 27 July 2009 at the Wayback Machine. Retrieved 9 November 2009. ^ "Festival de Cannes: Bright Star". festival-cannes.com. Retrieved 9 May 2009. ^ McElheny, Meghan. "Five minutes with Bright Star costume designer Janet Patterson: Editors' Blog". Wmagazine.com. Archived from the original on 24 January 2010. Retrieved 8 September 2010. ^ Anita Singh (15 May 2009). "Cannes 2009: film charts John Keats' romance with Fanny Brawne – in Luton". The Daily Telegraph. Retrieved 15 May 2009. ^ "Elstree Studios – Film and TV Search Bright Star". Elstreefilmstudios.co.uk. Retrieved 8 September 2010. ^ "Bright Star (2009)". Rotten Tomatoes. Fandango Media. Retrieved 16 March 2018. ^ "Bright Star Reviews". Metacritic. CBS Interactive. Retrieved 16 March 2018. ^ Colbert, Mary; Mathieson, Craig. 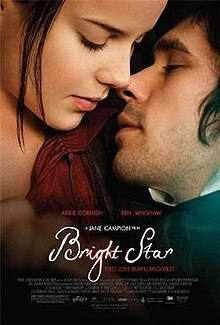 "Bright Star (review)". SBS. Retrieved 14 February 2013. ^ Plumly, Stanley (22 October 2009). "Bright Stars: Campion's Film of and from Keats". Poems Out Loud. W.W. Norton & Company. Retrieved 16 March 2018. ^ "Bright Star Soundtrack". Fanbolt.Com. Archived from the original on 10 July 2011. Retrieved 8 September 2010. ^ "Bright Star Soundtrack CD". Cduniverse.com. Retrieved 8 September 2010. ^ "Bright Star – John Keats – Penguin Group (USA)". Us.penguingroup.com. 16 September 2009. Retrieved 8 September 2010.